The Bloustein School takes Rutgers University and school student policies, procedures and resources seriously. They help contribute to a more efficient, effective, equitable and safe learning environment for its community. Below please find a sampling of areas that are frequently inquired about. For a comprehensive list of student policies, please see the school’s online catalog. Click titles to expand for more information. Click again to collapse. Athletic facilities are available on each campus. The nearest facilities to our school are the Easton Avenue Gym (a.k.a. Rutgers Fitness Center) or the fitness center at the Cook Douglass Recreation Center. All University athletic facilities require a valid RU Connection / ID card for entry. They also require that you first pass a fitness test (a.k.a. Fit Check) before you can use any cardio vascular equipment. There is a small fee for the testing. All students should explore green alternatives in their commute to the school. The Bloustein School has bicycle racks available for student use located by the front and back entrances of the building, as well as in the covered deck below. Please provide your own bicycle locks. Graduate students are permitted to purchase business cards at their own expense. Students interested in purchasing cards must go through the contracted University vendor Dupli Online by following these instructions. The Bloustein School is located in the Civic Square Building on the College Avenue Campus. The EE bus route services our location. Bus routes and schedules can be found online. There is support to both graduate and undergraduate, matriculating degree students with respect to career development and services. For graduate students, the Office of Student and Academic Services provides career development support to the Bloustein School’s masters programs in Public Policy and City and Regional Planning. Our staff is committed to helping students and alumni achieve their professional goals, and conduct individualized career advising sessions to navigate career decisions, job and internship searches, and employment preparation. For undergraduate students, support is provided through a comprehensive and thorough set of capstone professional practice courses on “Internship” and “Leadership” which hold weekly/biweekly seminars covering many career development oriented topics. Resume, cover letter, LinkedIn, project management, internship/employment search are among some of those covered. In addition to the instruction provided at the Bloustein School, students should also consult with the Rutgers University Career Services for information on reviewing interview techniques, other job opportunities and various employment support services. Individual counseling is also available to both students and alumni. For graduate students, the computing labs in the Civic Square Building require a separate account registration and creation process. You will need to complete a required application that can be found on your orientation USB drive and return it to Bloustein IT Services for activation. All Rutgers University students are required to create a NetID and password for use during their time as a student. Your NetID will allow you to log into course sites on Sakai, Blackboard or eCollege, see your final grades, obtain your transcript, register for additional courses, use computing facilities and access library materials from home. While setting up your NetID, you will be asked if you want to use a Rutgers email address. If you normally use a different address, you should type in your preferred email address where you currently read your mail. You can always change your email address later in your preferences. Students wishing to file a complaint about a course grade, or a grade received for a particular piece of work in a course, should first attempt to resolve the matter through discussion or writing with the instructor of that course (her/his preference) no later than two weeks after notification of the grade. If the issue cannot be satisfactorily resolved between student and instructor, the student may specify in writing the basis for the complaint and request a review by the appropriate program director. A written complaint about a grade for work completed while the course is in progress must be submitted to the program director no later than two weeks after final determination by the instructor. A student must submit a written complaint about a final course grade to the program director no later than four weeks after final determination by the instructor. A student who wishes to appeal the decision of the program director should appeal once again in writing to the office of the dean, through the Assistant Dean for Student and Academic Services. Students should be directed to address that written appeal to Stephen Weston, Assistant Dean for Student and Academic Services, Bloustein School Deans Office, 33 Livingston Avenue, New Brunswick, NJ, CAC. Email is preferred at sdweston@rutgers.edu. Written notification of the action taken by either the program director or by the assistant dean will be sent to the student no later than four weeks of the filing of the appeal, excluding those weeks in which classes are not in regular session. With reference to the actions above, the program director or assistant dean may consult with other faculty, directors, etc., that may be relevant to a student’s complaint. Watch grade appeal timeframes; being busy is not a legitimate excuse. Raise issues when they happen, not at the end of the term. Stick to the facts of the situation; discuss formally your appeal and keep it professional. Avoid emotional language and personal attacks. When asking for a second chance, admit where you have been culpable. Mentioning your grades in your other classes is not relevant. Be leery of end of semester/year grade appeals as they impact graduation deadlines. For questions about the grade appeal process, students, faculty and/or others are encouraged to speak to their instructor, program director or the assistant dean of the school for clarification. Although individual academic programs of the Bloustein School provide guidance as to their specific courses and academic standing requirements, there are some general schoolwide requirements that must be met prior to graduation from the institution. In all graduate programs, the Bloustein School requires that no more than 9 credits of C or C+ grades may be used in meeting the requirements for any degree. All students must also maintain an overall grade-point average of 3.0 or better at all times. In calculating the grade-point average, all courses taken while a matriculated student will be counted. Courses taken as a nonmatriculated student that are to be counted for the degree also will be included in the grade-point average. Should any of the above conditions not be met, the school may notify the student with respect to the deficiency and provide levels of sanction which can include any or all of the following: warning letters, academic probation, notations on transcripts, and academic dismissal. Students may have the option to repair the record based upon a formal review and what conditions are expressed in the message from the school. Although there are a variety of different policies governing academic standing requirements at the university, there are some general Bloustein School undergraduate program requirements that must be met prior to graduation from the school and completion of the major. 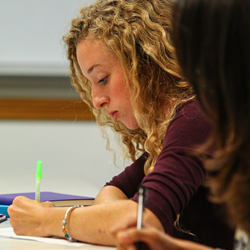 In all undergraduate programs, the Bloustein School requires that courses used to complete the major of study must be completed with a grade of C or better. If a student receives a grade of D in a required course for the major, the course must be retaken and a grade of C or better received in order to satisfy the requirement. New Jersey law (N.J.S.A. 18A:62-15) requires that every person enrolled as a full-time student in a public or private institution of higher education maintain adequate health insurance coverage. Full-time Rutgers students are required to show proof of insurance coverage. Students must either waive (show proof of private health insurance) or will be enrolled in the University-sponsored Student Health Insurance Plan. Hard waiver details and online forms can be found on-line. The link will also be available on the student’s tuition bill. Full-time students who do not show proof of adequate health insurance will be automatically enrolled in the University-sponsored Student Health Insurance Plan and the premium will be added to the student’s bill. Students with private health insurance and part-time students may voluntarily enroll in a University-sponsored Student Health Insurance Plan. Please visit the University Health Plans website for details on plans and how to enroll. For all health insurance questions call 848-932-8285 for Rutgers Student Insurance Office. Health insurance, student or private, is separate from Health Services on campus. For Health Services on campus using one of Rutgers medical or care offices, please visit the Rutgers Health Services website for more information. To schedule an appointment call: 848-932-7402. All Bloustein School graduate students must be certified in human subjects protection. Whether you work on data associated with surveys, or take a course that studies the same, this certification will enable you to be a part of that grant project or classroom experience now or in the future. There is an online exam that is available for certification purposes. Please visit the Protection of Human Research Subjects website or see your Methods I instructor. Most students find their own housing off-campus during their second year. Some students live nearby in the New Brunswick, Highland Park, East Brunswick, or Franklin Township, while others commute to school from Hoboken, Jersey City, Newark, Trenton, Princeton, etc. Be prepared for the relatively high costs of housing characteristic of the greater New York Metropolitan Area. Realtors may charge up to a 15% fee over and above the security deposit, and first and last months rent. There is no charge to obtain your first Rutgers student ID card, also known as the RU Connection card. However, you are required to be registered for at least one course at all times in order to receive your RU Connection card or keep it active. Aside from serving as your student ID, the RU Connection card is used to take out books from the library, doubles as your meal card at the dining halls, serves as your access key card to get into the Bloustein School, computer labs and Civic Square building parking deck after hours and on weekends. If you are a new student, you may wait until your arrival here in the fall to obtain your ID card, or you can also stop by any of the RU Connection offices on campus to obtain one. A listing of all RU Connection offices, their locations and hours of operation can be found on their website. You will receive your RU Connection card on the spot, after your photo is taken. The whole process takes mere minutes to complete. The Bloustein School makes arrangements to have University Librarian, Dr. Karen Hartman, visit each year and conduct an information session for our new Masters and Ph.D. students. This session is designed to help introduce you to the resources of the Rutgers Library System. Please see the Bloustein School student services newsletter/calendar for upcoming dates. For graduate students at the Bloustein School, lockers are available on a first-come, first-serve basis in the student lounge on the second floor of our facility. In order to obtain access, an assignment form will need to be filled out and submitted to Marie O’Brien. Marie has office hours on Monday through Friday from 8am to 4pm. If keys are not returned at the end of your academic year, a charge of $95 will be assessed to your student account. Lockers are cleaned out annually in the month of June. Graduate student mailboxes are located on the second floor in the student lounge and are used only for school-related correspondence. You are encouraged to check your mailbox regularly for incoming mail, announcements about graduation, your program requirements, etc. All personal mail must be sent to your home address. In addition, the email address you provide to the school will be used to circulate important announcements in a timely fashion through the school student listservs. The Bloustein School is a 5-10 minute walk from the New Brunswick Train station. Monthly discount student passes are available for NJ Transit, the state’s mass transit train system. The discount is 25% off the regular price for a monthly commuter pass. Student discount rail tickets may be purchased one-month in advance via the web. Establishing NJ residency may reduce your tuition bill. Proof of residency includes employment in NJ (verified by a NJ W-2), a NJ license and motor vehicle registration and/or voter registration. Contact the State Motor Vehicle Department at (609) 292-6500 to find out the location of the nearest license bureau. Voter registration is done at the Middlesex County Clerk’s office. To declare residency, fill out the residency analysis form available at the Registrar’s office. All questions regarding NJ residency must be directed to the Registrar at (848) 445-3556. After certain evening times and on weekends, students may park in the parking garage under the Civic Square Building – but will need to first register with the Rutgers Department of Transportation Services to obtain the proper hangtag to do so. Upon purchase of your parking credentials, your student ID card will be activated so that it can be used to access the Civic Square deck after hours during the week, and on the weekends. The New Street Deck is located on the corner of New Street and Joyce Kilmer Avenue (GPS address 134 New Street, New Brunswick, NJ). Registration is processed each term through the Rutgers Registrar and the online portal WebReg. New students are recommended to register for one or two of their required core courses over the summer. You can change your registration throughout posted add/drop periods. Registration changes done after the add/drop period may involve a late fee penalty. Changing your registration is done via the web or in person at the Registrar’s Office. Tuition and fees are due after registration. It is only after you have registered for one or more classes that you are able to apply for computer accounts (email), receive your RUConnection/ID access card and get access to a parking permit. The 2nd Floor Student Lounge/Walter Cope Evans Room is the primary social area set aside for Bloustein School graduate students. Equipped with a small kitchenette, television and generous seating, the Evans Room is a well-used venue for study breaks and group meetings. Student mailboxes are located in the Evans Room as well. Students are requested to be considerate of others when using the kitchenette and other facilities in this shared space. All food should be consumed in this space and not brought to other areas of the building. Office of Student and Academic Services staff are located in the first floor suite and are available during the day to provide all graduate and undergraduate students with advisement, counseling, registration, admission and other student-related issues. For specific questions regarding financial aid, academic standing and disability/health related accommodations, please contact Assistant Dean Steve Weston via email or via phone at 848-932-2728. His office is located is located in room 190 of the school’s student services suite. The University’s on-line academic calendar lists all breaks, observed holidays, exam periods, registration add-drop deadlines, etc. In addition, many classes during the first week of school are moved to different start times to accommodate new student orientations.